School Health | Macon County Health Dept. School Health Services plays a crucial role in your child’s comprehensive health. The Macon County Health Department works with public and private schools to provide health services intended to minimize health barriers to learning. Our trained staff helps students, pre-kindergarten through 12th grade, obtain safe and necessary county-wide school health services through technical assistance and health services guidance. We address day-to-day student needs, emergency needs, and in-school management of acute conditions like asthma, epilepsy, and others. It is our goal to keep students healthy and in class in order to obtain continued education. Some of our specific services are: flu vaccinations; dental screenings; evaluation of all children’s health history, development of care plans as needed; age-specific educational classes such as hygiene, puberty, First Aid and CPR. The Macon County Health Department is proud to serve as a medical resource in the development of policies and procedures in Macon County schools. Our trained staff collaborates on issues impacting the care of children in Macon County. We work with area schools to promote adherence to health guidelines as outlined by the State of Missouri. Please call 660-395-4711 for more information. A note on head lice: Nobody likes it or wants it!!! However it does happen and here are a few common questions and answers, along with a link to the CDC and to a printable handout about head lice. Of course if you have any questions do not hesitate to contact us. Why doesn’t the school send letters when there is a student in my child’s class with head lice? Why doesn’t the school nurse or other personnel do classroom checks when you know a student has head lice? “Current evidence does not support the efficacy and cost-effectiveness of classroom or school-wide screening for decreasing the incidence of head lice among children” (per CDC, May 2007). There are limited resources for all school services. Head lice is not a reportable communicable disease, it is considered a “pest.”  Since the school nurse has limited time to attend to the building needs, it is not reasonable or “good” use of district resources for the school nurse and other personnel to be involved in activities that are not supported by current medical or scientific research such as wide-spread lice screening. 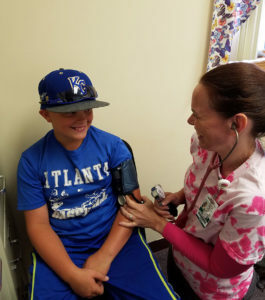 The school nurse’s main role in the school is to manage health services for medically impacted students – especially those with Life Threatening Conditions. He/She supports student health assessments (many times leading to special education evaluations and ongoing support), manages overall health and safety of the school community, promotes compliance with immunization laws and surveillance, provides health education as possible and attends to immediate issues as they arise. Doesn’t the school recognize what a problem head lice is for families?